A pet food company is recalling one of its products over fears that it could be harmful to your dog's health. 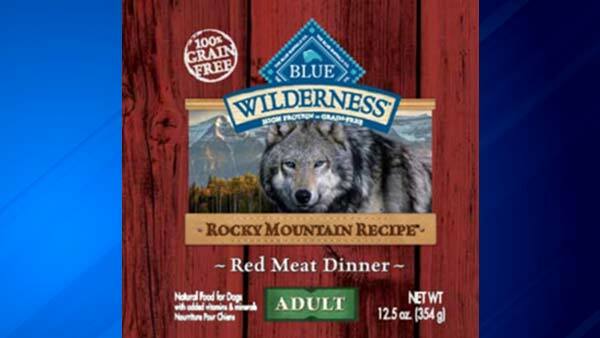 Blue Buffalo issued a voluntary recall for its Blue Wilderness Rocky Mountain Recipe Red Meat Wet Food for Adult Dogs, which the company said could contain elevated levels of beef thyroid hormones. Dogs that ingest high levels of these hormones may exhibit symptoms such as: increased thirst and urination, weight loss, increased heart rate and restlessness. Prolonged consumption could cause these symptoms to increase in severity and may include vomiting, diarrhea and rapid or difficulty breathing. According to the company, the symptoms may resolve when the use of the impacted food is discontinued. The FDA said a consumer reported symptoms in one dog, who has fully recovered. After an investigation, Blue Buffalo issued a recall for the one production lot in question. The production lot that is being recalled has UPC Code "840243101153" and a Best Buy Date of "June 7, 2019," which is found on the bottom of the can. The affected products were distributed nationally through pet specialty and online retailers. If your dog has consumed the product listed above and exhibited any symptoms, Blue Buffalo says you should discontinue feeding and contact your veterinarian. Anyone who has purchased the recalled product should dispose of it or return to the place of purchase for a full refund.